now and ever shall be. World without end. Amen. 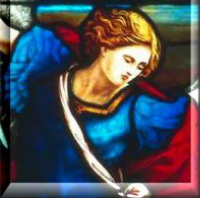 St. Michael ~ St. Gabriel ~ St. Raphael ~ and your Guardian Angel. O glorious prince St. Michael, chief and commander of the heavenly hosts, guardian of souls, vanquisher of rebel spirits, servant in the house of the Divine King and our admirable conductor, you who shine with excellence and superhuman virtue deliver us from all evil, who turn to you with confidence and enable us by your gracious protection to serve God more and more faithfully every day. Pray for us, O glorious St. Michael, Prince of the Church of Jesus Christ, that we may be made worthy of His promises. Almighty and Everlasting God, Who, by a prodigy of goodness and a merciful desire for the salvation of all men, has appointed the most glorious Archangel St. Michael Prince of Your Church, make us worthy, we ask You, to be delivered from all our enemies, that none of them may harass us at the hour of death, but that we may be conducted by him into Your Presence. This we ask through the merits of Jesus Christ Our Lord. Amen.